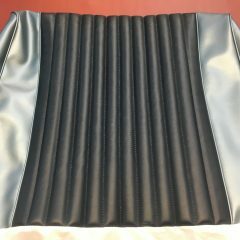 NEW SEAT COVER SET TO SUIT A 1965/66 FORD XP FALCON DELUXE HARDTOP. *LIGHT METALLIC BLUE SURROUND,WITH DARK BLUE INSERT. *SET INCLUDES:-TWO FRONT UPPER SQUABS,ONE LOWER FRONT SEAT CUSHION. *ONE UPPER REAR SEAT SQUAB,ONE LOWER REAR SEAT CUSHION. NEW SET OF SEAT COVERS TO SUIT AN XP FALCON DELUXE TWO-DOOR. *RED VINYL. *MADE FROM AN ORIGINAL TEMPLATE,TO ENSURE A PERFECT FIT. *RETRIM ONE FRONT SPLIT BENCH FRONT SEAT,AND ONE UPPER,AND LOWER REAR SEATS.